Lower the thermostat, whittle your waistline? You may want to program the thermostat in your office down a couple of degrees today, despite the more-than-chilly temperatures outside. A paper published Wednesday in the scientific journal Trends in Endocrinology & Metabolism suggests doing so could help you lose weight. Regular exposure to mildly cold temperatures help people burn more calories, according to the paper's authors, who have been studying this phenomenon for more than a decade. "Since most of us are exposed to indoor conditions 90% of the time, it is worth exploring health aspects of ambient temperatures," lead author Wouter van Marken Lichtenbelt said. "What would it mean if we let our bodies work again to control body temperature?" Over the last 10 years, Lichtenbelt and his team have discovered several key factors related to this link between fat and temperature. In 2009, the researchers, and others around the globe, found something called brown adipose tissue - or brown fat - in human adults. Scientists had previously believed that functional brown fat was only found in infants. Brown fat is different than the white fat most of us associate with obesity. Brown fat is thought to play a role in nonshivering thermogenesis, a form of heat production that happens in your body when you're not shivering - i.e. when the temperature is cool, but not cold. Animal studies have shown that nonshivering thermogenesis activates brown fat cells, which burn calories to create heat. Lichtenbelt and his team have found that nonshivering thermogenesis is weakened in obese people and in the elderly. And that obese people have less brown adipose tissue than people in the normal weight range. They've also found that losing weight can help obese people increase their brown fat activity. More recently, Lichtenbelt and his team showed that a 10-day "cold acclimation period" increased their study subjects' brown adipose tissue and nonshivering thermogenesis. After spending six hours a day in 59-degree temperatures, the participants shivered less and were more comfortable in the cold. 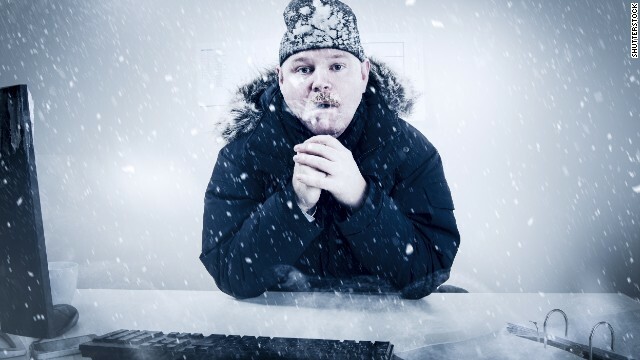 The results suggested to the researchers that "a variable indoor environment with frequent cold exposures might be an acceptable and economic manner to increase energy expenditure." Lichtenbelt suggests varying the temperature in your house and your office by a few degrees over time. Letting the indoor temperature rise and fall will encourage your body to adjust its internal temperature accordingly, he says, increasing your energy expenditure. "More frequent cold exposure alone is not going to save the world," from obesity, he says, "but is a serious factor to consider for creating a sustainable environment along with a healthy lifestyle." People just crank up the heat, stay inside and eat more in the winter. Not everyone stays inside w/ the heat up! We leave ours on 55 day and night and wear sweats. We don't "sit" all day, either! It doesn't say you burn fat generally. You will burn brown adipose tissue only, which, if you are not in great shape, you don't have much of. So, you won't burn much fat if you have a lot fat to burn. I usually gain a bunch of weight in the winter despite exercising. In the summer it is easy to lose weight. You burn many calories (all types of fat) because it is really hot, you burn some calories because it is really cold. Before you run and turn that dial down, this "research" misses one key point: People eat more, and worse (fattier starchier foods), when it's colder. Conversely, they drink more water when it's warmer. Yes, you will burn more in a colder environment, but that only works if calorie intake is kept the same, which doesn't happen outside of controlled labs. As I set keyboarding in this message, the temperature sets at 60 F in the room. When the temp outside hits 50 F in the morning, I'll take my long distance run in shorts with a shirt optional. I eat more fat in the cold not more starch or sugar. In the brittle cold, I've been know to eat a bar of dairy butter with relish. Of course, I had miles to go in the cold. I don't know much about the facts of how it works but I definitely know that I have lost more weight over the last 2 years, than I have in my whole life. All I have been doing differently is cracking my window open at night (because I am married and not allowed to lower the house temperature) and I now run year round outside, even when it is in the negatives. My ability to function in the extreme cold has, most likely, prevented me from getting sick and I feel like I am in the best shape ever! I would love to be in the 40-50 degree temps year round but I don't see that happening.